The model DF Z22 is a three-phase industrial vacuum cleaner, equipped with fan with backward-curved blades that ensures an high air flow rate. 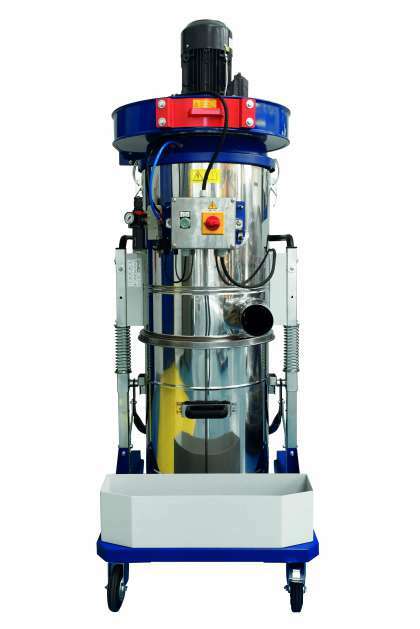 Ideal for fixed applications connected directly to the machine for filtration and vacuuming of aluminium or metal dust and swarf. In addition to DEPURECO standard quality and safety features, DF Z22 is equipped with circuit breaker IP65 with electric phase control sequence, additional silencer, filter chamber and dust container in AISI 304 Stainless Steel, anti-static filter Class “M” that features a new filter cleaning system (PSC), which ensures highly effective cleaning. We offer as an optional accessory the absolute filter certified by the German certification body IFA, class H14 (99,995%), for vacuuming of fine or toxic dust. The industrial vacuum is certified as suitable for use in potentially explosive atmosphere according to the European Directive ATEX 2014/34/UE ATEX II3D.